Home > Labels,Tags & Nameplates > Custom Nameplates > Brass Nameplates (Single Colour) > Brass nameplate (1 colour), 50mm x 50mm. Brass nameplate (1 colour), 25mm x 50mm. Custom etched and filled brass nameplate to your own design. Size 50mm x 50mm. Supplied either with adhesive backing or drill holes for fixing. Supplied in packs of 100 nameplates. Custom printed labels. Brass nameplates, 0.5mm thickness, etched and filled to your own design in a single colour. 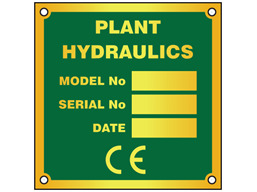 Nameplates are abrasion, chemical and weather resistant. Supplied either with self adhesive backing or drill holes for fixing. In packs of 100 nameplates. NMS2B Size 50mm x 50mm. Material brass.